A harvesting effort by Program Executive Officer Land Systems and Marine Corps Systems Command could save the Corps millions and make one of its newest vehicles more survivable. The Gunner’s Protection Kit, managed by Infantry Weapons within MCSC’s Portfolio Manager Ground Combat Equipment Systems, is currently installed on High Mobility Multipurpose Wheeled Vehicles. As a cost-savings measure, the kits will be removed from HMMWVs and installed on Joint Light Tactical Vehicles as they are fielded to the fleet next year. Using harvested parts instead of buying new potentially saves the Corps more than $100 million. 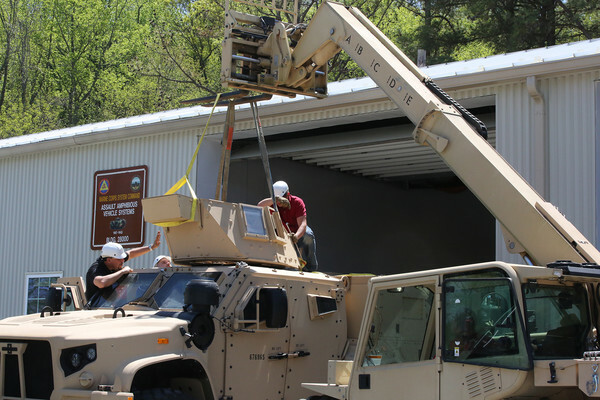 In the spring, logisticians and other program personnel from Infantry Weapons conducted a Proof of Principle, or PoP, going step by step through the process of removing a Marine Corps Transparent Armor Gun Shield—part of the GPK family of systems—from a HMMWV and placing it on a JLTV. The MCTAGS will be installed on the Heavy Guns Carrier JLTV variant. The PoP will help the program office develop, verify and publish a modification instruction to guide the Corps through the installation process, said Kevin Marion, a logistics management specialist in Infantry Weapons. The JLTV program office has completed similar PoP efforts with the Improved TOW GPK, or I-TGPK, which will be installed on the Close Combat Weapons Carrier variant of the JLTV. The CCWC can be armed with TOW—tube-launched, optically tracked, wire-guided—missiles. The JLTV is an Army-led light tactical vehicle program. It will partially replace the Army and Marine Corps HMMWV fleet, providing a more survivable vehicle, and closing an existing gap in payload, performance and protection. The JLTV comes in four variants with payloads ranging from 3,500 to 5,100 pounds of cargo, and can go more than 70 miles per hour as well as traverse over arduous terrain. Although only two variants will be equipped with the MCTAGS or I-TGPK, all JLTVs will contain harvested radios, antennas and other communications equipment from HMMWVs. “It’s our responsibility as MCSC to be good stewards of taxpayer money, so if we have equipment that is in good condition, we should go ahead and use it,” Marion said. An advantage to Marines is the tactics, techniques and procedures will remain largely unchanged for the harvested equipment, so they already know how to operate it, Rodgers said. The HMMWVs will be demilitarized and traded through the Equipment Exchange Program. This program enables the organization to work with commercial vendors who can sell or use the vehicles as they see fit. Once vehicle fielding begins next year, Marine Corps field service representatives will execute the harvesting plan for the units that receive them, Rodgers said. This is part of the program’s “total package fielding” plan. “As we field the JLTV, we’ll collect the HMMWV, harvest the parts, install them and then return the new vehicles [to the units],” Rodgers said. Fielding for the JLTV will begin in spring 2019 to the Marine Corps School of Infantry-West at Camp Pendleton, California; School of Infantry-East at Camp Lejeune, North Carolina; The Basic School at Marine Corps Base Quantico, Virginia; and Motor Transport Maintenance Instructional Company at Camp Johnson, North Carolina. Fielding to the operating forces will begin in the summer of 2019. In all, the Army plans to purchase 49,000 JLTVs and the Marine Corps will purchase 9,091.